Barratt Developments PLC is one of the largest residential property development companies in the United Kingdom. It was founded in 1958 as Greensitt Bros. but control was later assumed by Sir Lawrie Barratt. It was originally based in Newcastle upon Tyne but is now located at David Wilson's former offices in Coalville. It has been listed on the London Stock Exchange since 1968 and is a constituent of the FTSE 250 Index. In 1962, Lewis Greensitt (a Newcastle builder) and Lawrie Barratt (an accountant) acquired control of the Company and embarked on a five-year expansion plan. The Company was floated on the Stock Exchange in 1968 as Greensitt & Barratt by which time the growth plan had been “fully achieved”. Lewis Greensitt left shortly after the flotation and in 1963 the Company was renamed Barratt Developments. The 1970s saw Barratt making a series of acquisitions, transforming the Company from a local house builder to a national firm building around 10,000 houses a year, and rivaling George Wimpey in size. The largest of these acquisitions were the Manchester firm of Arthur Wardle and the Luton-based Janes. Allied to this was substantial organic expansion. Central to Barratt’s expansion was its high profile marketing, with national advertising, featuring Patrick Allan and the helicopter. 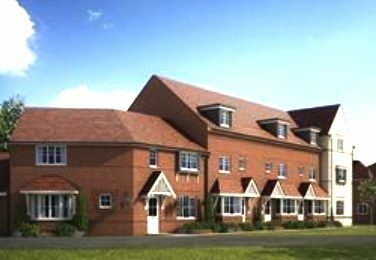 Barratt provided starter homes for the first time buyer and offered part-exchange to those trading up. In the year to June 1983, Barratt sold a record 16,500 houses making it by far the largest housebuilder in the country. It was to be more than twenty years before Barratt regained those volumes. In 1983 and 1984 Barratt was hit by two successive ITV World in Action programmes, the first criticising timber framed housing and the latter, starter homes. Within two years, unit sales had more than halved. Lawrie Barratt led a total restructuring of the Company, abandoning timber framed construction, launching a new product range, and concentrating on the more profitable trade-up market. In 1991 the Company was badly hit by a recession and recalled Lawrie Barratt from retirement: he retired for good in 1997 and remains Life President of the Company. In 2004 the Company sold Barratt American, its US operation, established in the 1980s in California. Mark Clare was appointed Chief Executive in succession to David Pretty in 2006. Following the house price boom in the later 1990s and early 2000s, which saw a number of Barratt’s largest rivals, such as Persimmon, George Wimpey and Taylor Woodrow all acquire rivals to increases in size, Barratt broke its tradition of 30 years and acquired Wilson Bowden, best known for its David Wilson Homes brand, for £2.7bn in 2007. This brought the David Wilson, Ward Homes and Wilson Bowden Developments brands to the group. In 2008 the Company secured a restructuring of its banking covenant package. Margaret Thatcher famously purchased a house on one of Barratt's most up market estates, in Dulwich, South London. Barratt also used to have a self-created up-market brand, KingsOak Homes but now uses the David Wilson Homes brand for this purpose. Barratt owns and operates Wilson Bowden Developments, which develops commercial property in the UK. For several years, Barratt Homes has used an oak tree as its logo, and there have been at least three versions of it. For a long time the company also used the slogan ‘Britain’s Premier House Builder’. The reasons for this is that Barratt is widely regarded as Britain’s best-known house builder amongst the general public, and some people still view Barratt Homes, along with George Wimpey, as the two large, mass-volume house builders in the UK. Following the acquisition of Wilson Bowden in 2007, the Management decided to give the Barratt corporate identity a facelift. The same logo used by Barratt Developments PLC for corporate purposes and Barratt Homes for marketing purposes was scrapped, and the there are now two, slightly different logos for the two purposes, although they both still feature a tree. In addition, the Barratt Homes slogan was changed to ‘built around you’, emphasizing that for the previous fifty years, customer feedback had gone back into the building process to improve house building. The re-launch included a massive TV and newspaper advertising campaign. Barrett's commitment that now comes with their exclusive 5 year warranty.